Steven Sasson was only 24 when he created an important discovery that would become a milestone in the world of modern photography in the 20th century. In 1975, he tried to make a Rube Goldberg machine, a tool that performed simple tasks but complicated photographic techniques. The Rube Goldberg machine from Sasson comes in the form of a camera. Currently, the machine is as big as a microwave with a weight of 4 kg. His work produced US4131919A "Electronic Camera" in 1977. 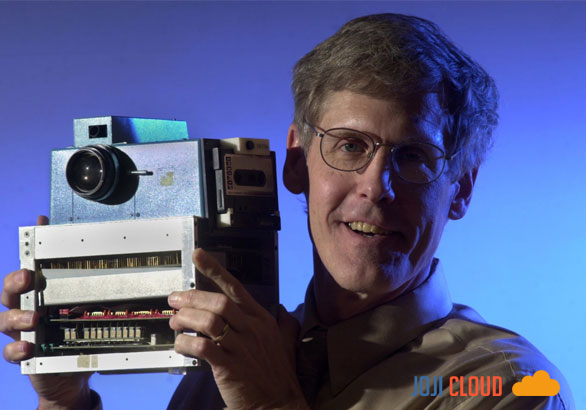 This camera was part of his job when he was employed by Kodak at the Applied Electronics Research Center. Armed with this camera, Sasson then entered the meeting room filled with Kodak officials to begin showing the results of his work. "This camera requires 50 minutes of time to capture an image, but it takes 23 seconds to store it on a tape," Sasson said, confidently quoted by The New York Times. "I'll take out the tape, give it to the assistant, and put it in the player." About 30 seconds later, a black-and-white image of 100 out of 100 pixels appears, "he added. Unfortunately, Kodak officials were not impressed by the creation of Sasson at the time. Kodak at that time was a fairly dominant business in the world of world photography. Conventional products such as cameras, flashlights and films are capable of producing them. "Printing technology has been with us for over 100 years, no one has complained about printing, and printing is also cheap - why do people want to see their pictures on TV?" , Said the head of Kodak at the time. Although rejected by Kodak officials, Sasson's work later became the original concept of what is known as digital photography. Michael Shamiyeh, in his book "Building Desired Futures: Turning Design Into Real Innovation (2014)," says Sasson as a person wanting to create something. Little Sasson, who lives in Bay Ridge, Brooklyn, NY, often conducts scientific experiments. Playing with gunpowder or becoming an amateur radio operator is a rewarding experience. One of the points that interested him in the world of mechanics is when his radio antenna has disturbed the television signal of his neighbor. To satisfy his desire to play with electronic devices, the young Sasson often collects electronic components from old televisions that his owners have. In this way, he knows transistors, integrated circuits and other electronic components. During the school holidays, Sasson was known to have worked in several places. He had worked as a runner, a term for workers who issued and submitted documents or certificates between brokers on Wall Street. Sasson has also explored electrical, mechanical, and scientific experiments at Brooklyn Technical High School as a place to acquire famous knowledge that gives rise to translucent students at the best technical universities in the United States. Sasson finally entered the Rensselaer Polytechnic Institute. He obtained a bachelor's degree and a master's degree in electrical engineering. In 1973, amid the euphoria of young Americans wishing to serve NASA, Sasson chose to work at Kodak. Under the supervision of Gareth A. Lloyd, he was given the task of creating cameras that did not require film or paper to create images. "Almost nobody knows I'm working on it, because it's a small project [...] It's not a secret project, I think, it's just a project that (maybe created) so that I do not create problems in other parts, "said Sasson.